Fifth Avenue in 1907 was changing. Grand limestone, marble or brownstone mansions still lined the broad avenue; however the northward march of retail establishments was causing millionaires to flee further uptown, erecting chateaux and palaces along Central Park. Mansions were being demolished to be replaced by commercial buildings or transformed upper-class stores. 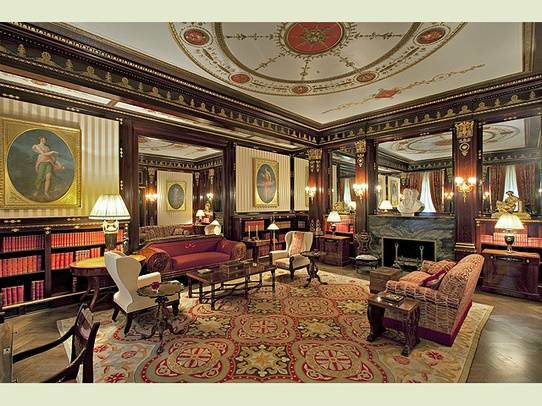 At 59th Street the Plaza Hotel was being completed, across from the imposing residence of Cornelius Vanderbilt II. This was the year that real estate investor Charles A. Gould commissioned Woodruff Leeming to convert his home at No. 714 5th Avenue to a six story commercial building that purposely blended with the homes of the wealthy who had not yet surrendered the battle. 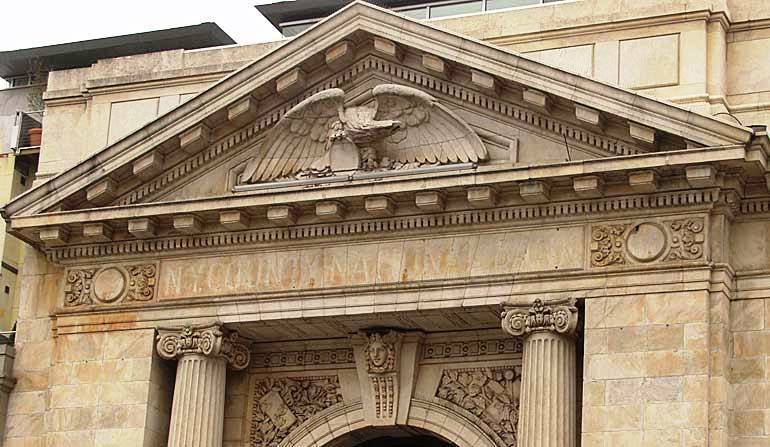 Retaining its original 1871 proportions, height and style, the converted limestone facade mimicked its neighbors. The mansard roof continued the line of the former parsonage of the 5th Avenue Presbyterian Church to the south and the Zabriskie residence to the north; and the overall French style melded into the environment. 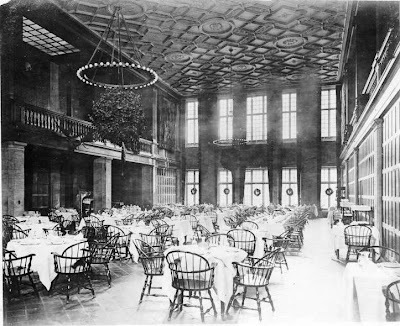 The design of Gould’s renovation was unique – the first two floors being a single retail unit and the third through fifth floors being treated as a whole -- essentially a wall of glass structurally and architecturally far ahead of its time. As the building was being completed in 1908, Francois Coty was becoming rich in France with his perfume, La Rose Jacqueminot, introduced in 1904. By 1910 he was expanding and searching for an appropriate New York headquarters. He found it at No. 714 Fifth Avenue. Coty signed a 21-year lease for the building paying between $20,000 and $25,000 per year. Immediately after acquiring the property, Francois Coty commissioned the famous French glassmaker, Rene Lalique, to replace the wall of windows on the central floors. The extraordinary three-story work of art, reminiscent of the Art Nouveau designs that made the artist world-renowned, consists of intertwining vines and flowers climbing up the side windows while leaving the central-most panes clear. The overall effect of the composition could be appreciated only from the street. 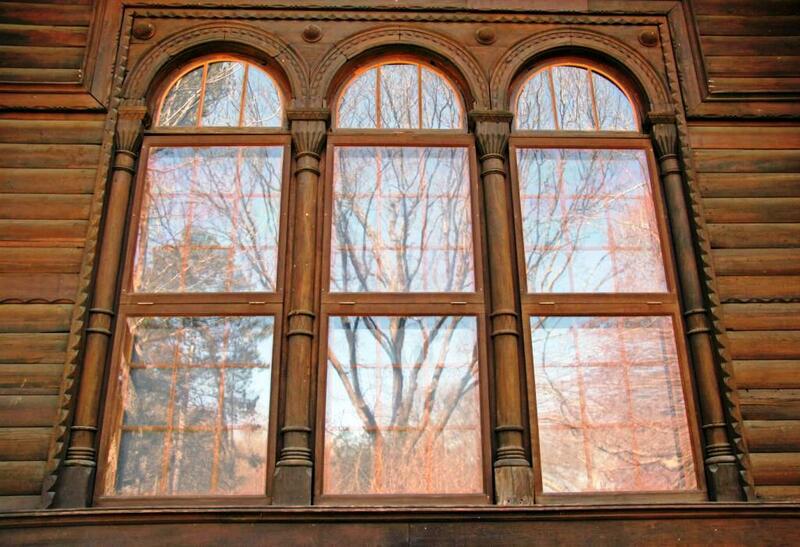 The windows, while not original to the design of the building, instantly became its most striking feature. 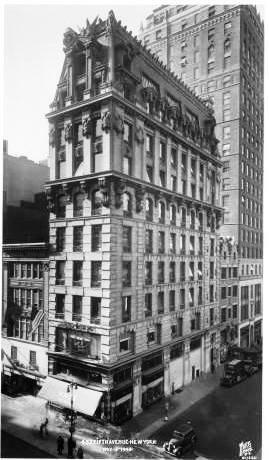 Coty occupied the three floor with the Lalique windows and subleased the first two floors to the Stage Society of New York and the top floor to various tenants. As American doughboys returned from World War I they brought with them Coty perfumes and powders, creating new demand across the country. Coty’s American business skyrocketed. A factory and laboratory were built on Manhattan’s west side to avoid the importation tariffs. The factory was manufacturing, by 1929, 23 different perfumes and a seemingly unending list of other cosmetics and toiletries. 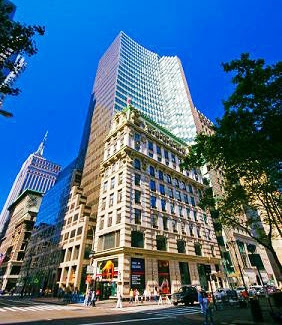 Coty renewed its lease in 1931; however a year after Francois Coty’s retirement in 1940, the firm moved to 423 West 55th Street. 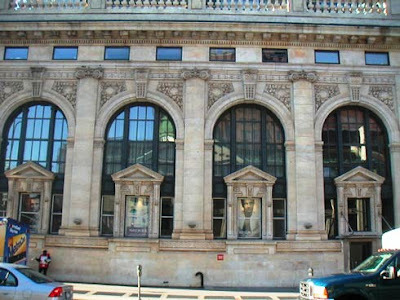 The building, however, would continue to be referred to as The Coty Building. A heated battle broke out between preservationists and developers when in 1985 a plan was unveiled to erect an L-shaped, 44-story office tower with entrances on West 56th Street and on Fifth Avenue. The plan would necessarily involve the demolition of Nos. 712 and 714 Fifth Avenue. The Municipal Art Society took up arms and petitioned the New York Landmarks Preservation Commission to landmark the building. When the Lalique windows were brought to the attention of the Commission, it agreed to schedule a hearing. The Commission designated the Coty Building a landmark; but on May 28, 1985 it also approved a Certificate of Appropriateness for the tower to be built behind them, incorporating the facades of the two former houses. 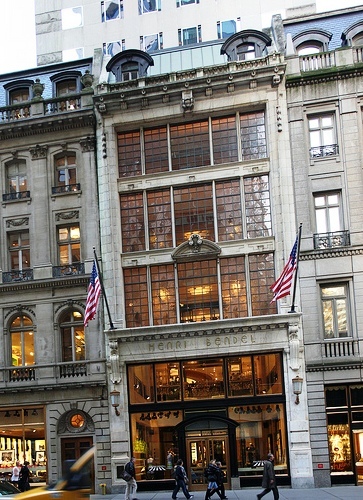 Between 1989 and 1990, architects Beyer Blinder Belle restored the façade and renovated the interior as the flagship store of Henri Bendel. A four-story atrium replaced the former Coty offices and, for the first time, Rene Lalique’s exquisite windows could be viewed as a whole from an inside perspective. The passerby may not notice that nothing is left of the Coty Building other than its façade. The copper-clad roof and dormers, the soaring two-story retail entrance and Rene Lalique’s unique and priceless windows appear much as they did in 1910. Only by entering the threshold does one enter the 21st Century. 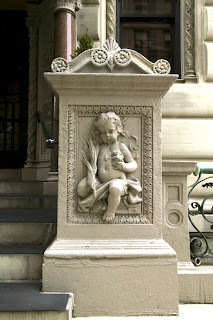 When the handsome brownstone-fronted house was built at 50 West 12th Street in the years prior to the Civil War, no one could have anticipated the attention it would draw. Then on January 15, 1905 resident Henry J. Smith was locked up and fined $3 the next morning at the Jefferson Market Court, charged with intoxication. Smith had accused three men and a woman of robbing him. “I was robbed of $4 in a chop suey place, and there stand the people who did it,” he told Patrolman Steinmeyer of the West 13th Street Station. 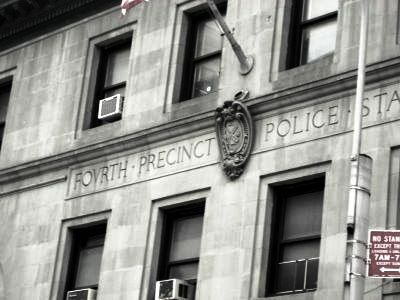 According to The New York Times, the three “of apparent respectability were pointed out by Smith, and all four were indignant when the policeman repeated the complaint and took them to the station.” The group had been to a dance in Harlem, had just exited the 42nd Street Subway station and were saying good-night when Smith identified them. “Smith seemed to be overcome by something or other while the episode was being discussed, and the Sergeant decided that he was not in a condition to be on the streets alone, and ordered him locked up,” reported The Times. By 1915 things settled down at No. 50 West 12th Street. Irving Simon, president of Levia Realty Company, purchased the house for $22,000 then spent another $8000 on renovations, including a large “skylight studio” on the fourth floor, “modern plumbing, electricity and steam heating. Rent for the house jumped from $1500 a year, furnished, to $3550. That year the house began its tradition of housing artistic types with artist Adolf Lawson renting the first floor for $800 a year, and stage dancer August Duncan occupying the third and fourth floors at $1800 per year. The second floor with its 14-foot high ceilings was leased for $950. Towards the end of the 20th Century No. 12, by now reconverted to a private residence, was owned by musician David Byrne of the Talking Heads. 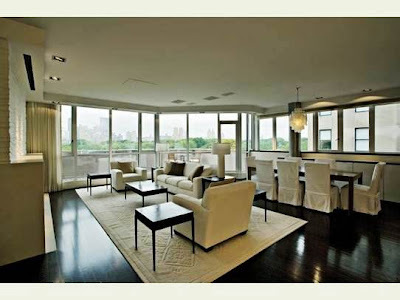 Around 2005 he sold the property to renowned artist Melinda Hackett. And that’s when all the attention really started. The new notoriety had nothing to do with stolen watches, or intoxication, or an historic townhouse in the Greenwich Village Historic District. It had to do with a treehouse. Hackett wanted her three daughters, accustomed to the freedom of grassy North Salem, New York, to have their own private retreat. 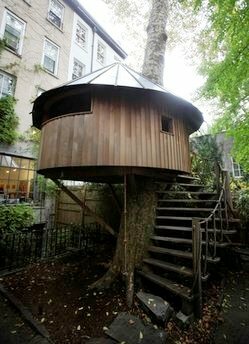 In the small backyard stood a venerable London Plane tree, just aching for a treehouse. The artist commissioned Nick Cohen and Ashley Koral – whom she already knew – to design and build the juvenile getaway. $5000 and about five months later the Hackett girls had a unique, circular treehouse with a winding staircase. 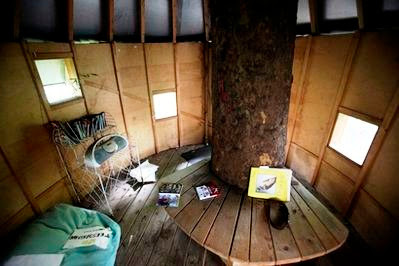 Architect Robert Strong told the Associated Press “It's a beautiful treehouse; it has a beautiful design. It's wonderful the way it encompasses the branches; it's completely rounded, flowing much like the tree." Hackett’s neighbor did not agree. An anonymous complaint charged Hackett with building “a structure in the rear which is nailed to a tree,” seemed unsafe, and was constructed with no posted permit. It was the beginning of a months-long battle. 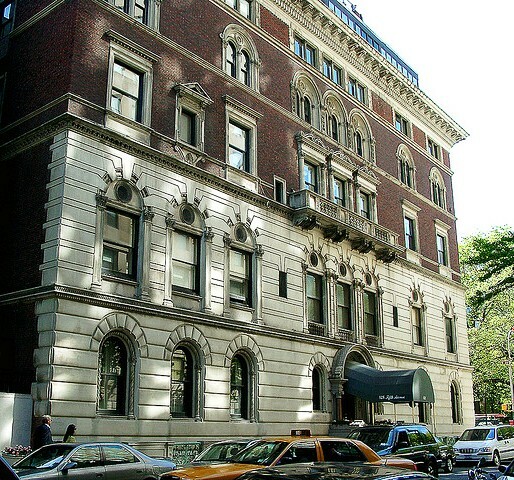 The artist appeared before the court of the Environmental Control Board, filed retroactively for a building permit, fought three violations from the Department of Buildings, and pled her case before the New York City Landmark Preservation Commission (she had altered an historically-designated property). 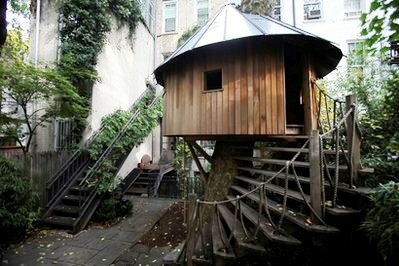 In the Fall of 2010, much to the chagrin of the nameless neighbor – whom at least one journalist termed “grumpy” – Melinda Hackett’s treehouse was granted a stay of execution by the Landmarks Commission. Although the legal battle cost Hackett about as much as she spent to construct the treehouse, her daughters still have their private place where “They plot. They scheme. They gossip,” as their mother put it. In 1800, a year after John McComb, Jr. designed Archibald Gracie’s country house – which would become known in the 20th Century as Gracie Mansion, the official residence of the Mayor of New York – and three years before he received the commission for New York’s City Hall, the architect was hired by Alexander Hamilton to design his country estate. 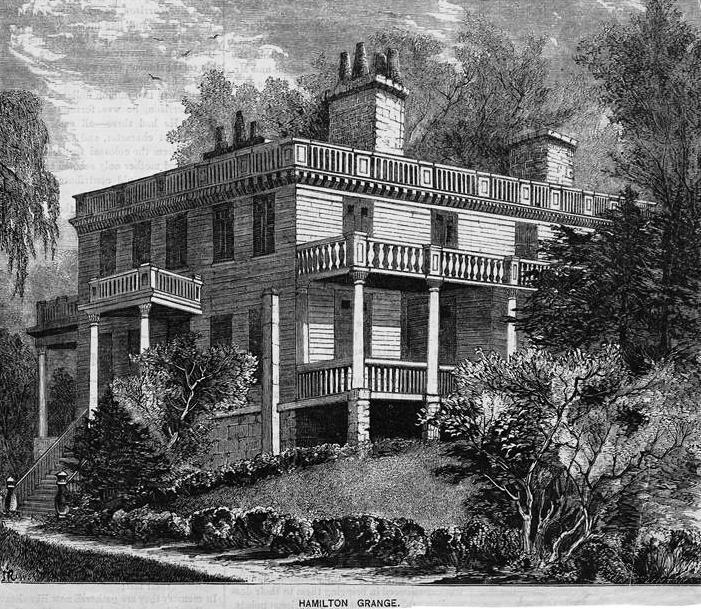 That summer Hamilton had purchased land eight miles north of the city where he would erect the first house he owned; an undertaking he called “my sweet project.” He chose a site near the estate of his friend, Gouverneur Morris, with astonishing uninterrupted views of the Hudson and Harlem Rivers; roughly where 143rd Street and Convent Avenue is today. 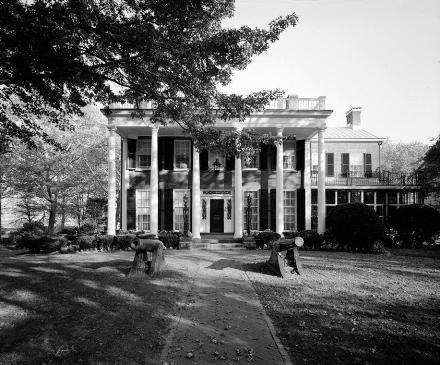 McComb produced for Hamilton an elegant two-story frame Federal residence with columned porches on all sides to catch the summer breezes. Completed in 1802 Hamilton named the eighteen-room mansion “the Grange,” after his ancestral home in Scotland. Alexander Hamilton lived in the Grange only two years with his wife, the former Elizabeth Schuyler, their eight children and his mother, Rachel Faucett Lavien. On July 11, 1804 he died in the infamous duel with Aaron Burr. 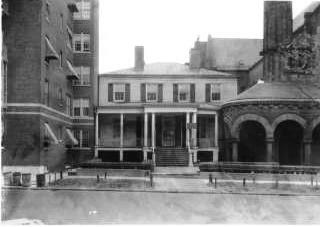 The Hamilton family lived on in the house for another three decades after which various families owned it as the Harlem neighborhood rapidly grew. 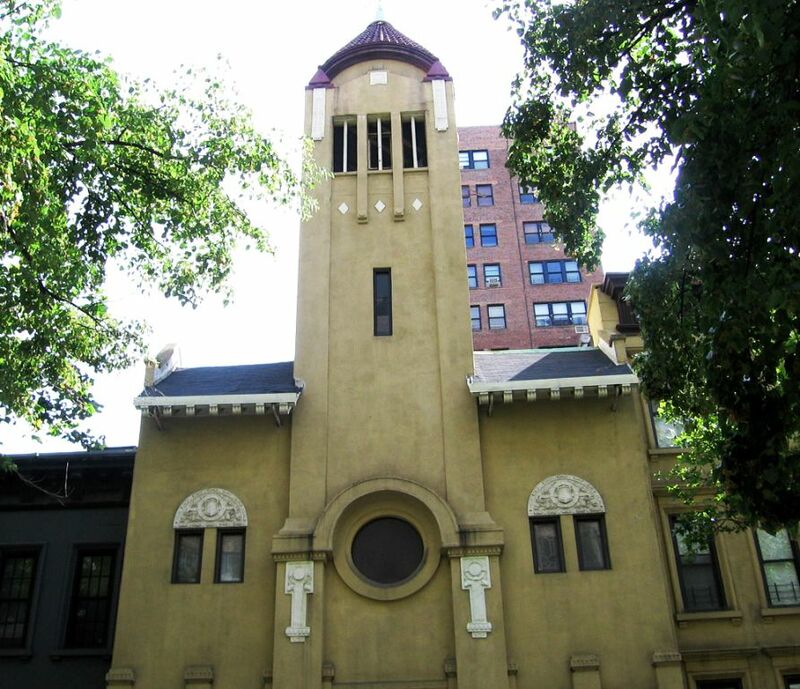 In 1889 the Greenwich Village parish of St. Luke’s Episcopal Church purchased land that included the Grange as it anticipated its northward relocation. By now the area was becoming heavily populated and as city street construction commenced, the house occupied a site directly in the path of 143rd Street. The church moved the building 350 feet southeast to 287 Convent Avenue, where it was used for services while a permanent structure was planned. 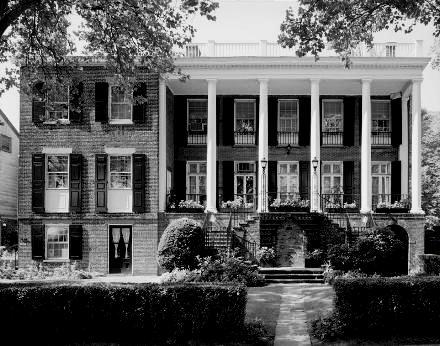 John McComb’s elegant porches, the cornice and roof balustrade were stripped off. The broad entrance steps were removed, the imposing entranceway was boarded shut and an entry was cut into the side, which now faced the street. The parish began construction of its new church in 1892. When the attractive Romanesque church was completed in 1895 it came within feet of the Grange. A few decades later a six-story apartment building rose on the opposite side, cramping Hamilton’s house between. The once-elegant residence which had sat among 32 acres of lawns and gardens was unrecognizable in its claustrophobic setting. At a time when historic homes and buildings were given little importance, the Grange began attracting some attention. 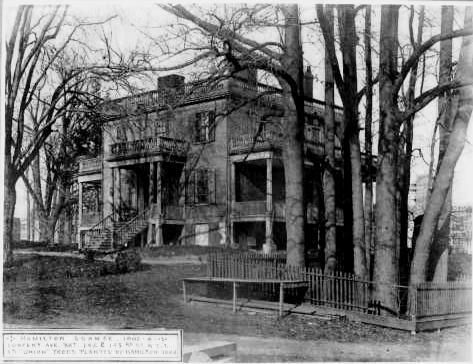 On May 6, 1908 an act authorizing the City of New York to purchase the mansion and move it “to a site in St. Nicholas Park, formerly constituting a part of the Alexander Hamilton farm” was passed by the State Legislature. 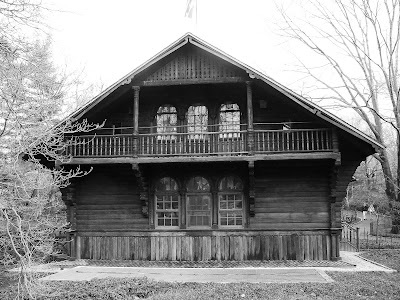 Four years later the American Scenic and Historic Preservation Society purchased the house and, nearly a decade after that, in 1933, opened it as a museum. The Crescent Athletic-Hamilton Club presented the Grange in June of 1936 with the 30-foot bronze statue of Hamilton which had stood before the Brooklyn Heights club since 1892. 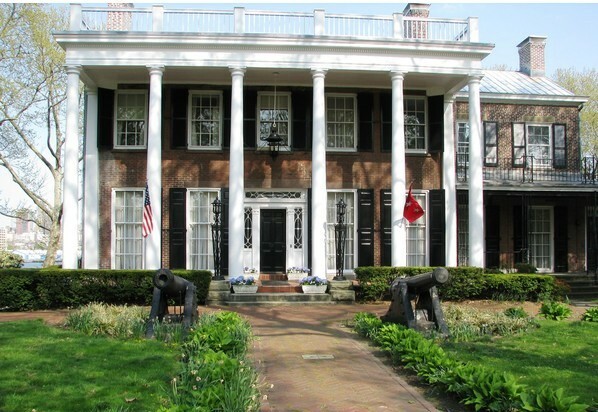 Two weeks later the Kennedy Administration passed a resolution to acquire and preserve the Hamilton Grange as a national shrine under the ownership and management of The National Parks Service. At long last, in 1967, the City of New York Landmarks Preservation Commission designated the house a landmark. On June 25, 1999 State Assemblyman Keith L. T. Wright requested perpetual easements for a portion of St. Nicholas Park for use as a site for the Hamilton Grange national Memorial. Within four years the Park Service had set aside $11 million to move and restore the house. 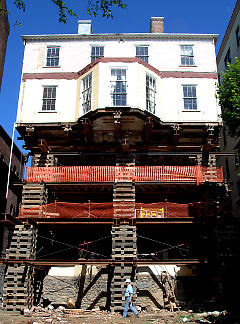 In early May 2008 the Grange was gradually jacked up 35 feet off the ground – a process that took two weeks. Lowered onto rollers, it was cautiously inched a block and a half down Convent Avenue to the park – part of Hamilton’s original estate. Of the $8.4 million earmarked for restoration, the move accounted for approximately 40%. The National Park Service initiated studies to determine precisely how the house looked in 1802 in order to fully restore the exterior. The Grange was reopened to the public in September 2011. 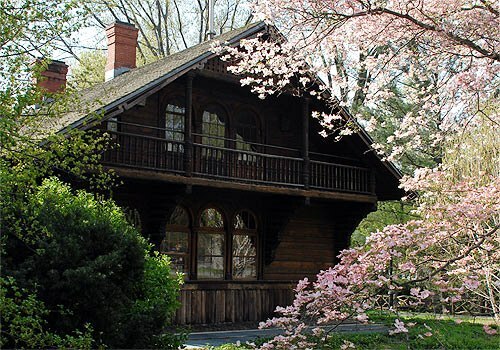 Its new site in St. Nicholas Park allows the visitor, once again, to fully appreciate the house in a suitable setting. Nathaniel Bush held the enviable position of official architect to the New York Police Department for over three decades. From 1862 to 1895 he produced numerous station houses throughout the city. Not only was Bush an architect, but he was an NYPD sergeant, as well. With the consolidation of the five boroughs in 1898 the New York Police Department quickly grew. Within the next few years plans were underway for a surge of station house construction. Requests poured in to the City Controller’s office to investigate the fees paid to Horgan & Slattery. In 1901 Controller Grout reported that $193,661.34 had been paid to the firm in that year alone. As the building boom began, Hoppin & Koen were hired to design the magnificent Police Headquarters at 240 Centre Street, completed in 1909 – a domed Baroque palace. 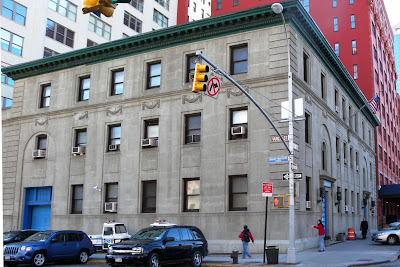 Three years later they were commissioned again to design the Fourth Precinct station house at 16 Ericsson Place. The Fourth Precinct had been housed in an 1871 structure which was no longer adequate. Throughout the late 19th Century the precinct was home to numerous murders, assaults and other crimes. For its new station Hoppin & Koen designed an Italian Renaissance palace with a large stable on the southern end. The exterior of the building is extraordinarily unchanged since 1912 and police horses still occupy the paddocks of the stables. Not until after the unsuccessful Hungarian Revolution of 1848-1849 did the first Hungarians immigrate to New York City. This new addition to the city's diverse population heartily welcomed the revolutionary Louis Kossuth when he visited Manhattan in December of 1851 to rally financial and political support for his cause. In the 1870’s, however, over 10,000 Hungarians had settled in Manhattan in, for the most part, two 2nd Avenue neighborhoods: between 1st and 10th Streets, and between 55th and 72nd Streets. New York historian Konrad Bercovici wrote “The houses of the Hungarian district in New York are more or less of the modern tenement type...It is within that the homes are different from the houses of the people of other nationalities...It is in the kitchens of these houses, spick and span, [that] one can notice the differences of national character. Love of good food, spicy and tasty, is one of the characteristics of the Hungarians." Thousands more crushed into the Hungarian neighborhoods and by 1910 estimates of the population ranged from 76,625 to over 110,000. In 1895 a small group founded The First Hungarian Reformed Church, or New York-i Első Magyar Református Egyház. Their charming three-story edifice with central bell tower at 121 East 7th Street was reminiscent of a rural church. As the Lower East Side became increasingly congested, more and more Hungarians migrated north to the Yorkville section of the city -- of which Random House's Depression era "New York City Guide" would write "The Hungarians, in the upper seventies, aid in giving Yorkville its Central European atmosphere. The Hungarian daily, Amerikai Magyar Nepszava, is found on the newsstands in this vinicity; Tokay wine is featured in the liquor stores; and in the delicatessens are sold goose livers and the famed Hercz, Pick, and Drossy salamis from Budapest. The Hungarian cuisine is noted for its variety and savory sauces; in this neighborhood, particularly on East Seventy-ninth Street between First and Second Avenues, are many restaurants whose specialities are chicken paprikas, rostbraten, and strudel." 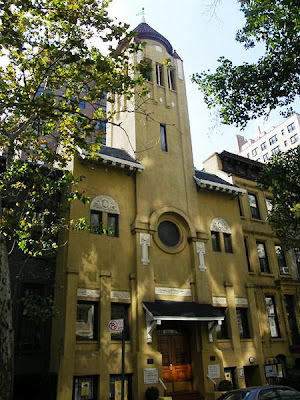 In 1914 the congregation opted to build a new church on a plot purchased at 344 East 69th Street. Hungarian-born architect Emery Roth was commissioned to design the structure. 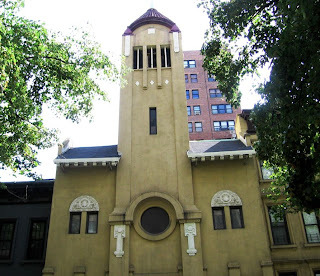 Roth would go on to design some of Manhattan’s most memorable Art Deco apartment buildings; however for The First Hungarian Reformed Church he drew his inspiration from his homeland. Combing traditional Hungarian styles with Vienna Secessionist touches he created an unpretentious but strikingly unique facade. Completed in 1916 at a cost of $22,000, the facade incorporates brick, tile, stucco, tile and limestone. Dramatically punching through the deeply overhanging eaves is an 80-foot bell tower. The First Hungarian Reformed Church, while quaint and charming, was home to no-nonsense worshippers with a decided purpose. 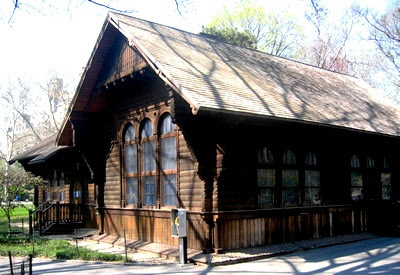 Reverand Zoltan Kuthy, the pastor who dedicated the new structure, would go on to be one of the most active and influential figures in Hungarian-American Protestantism. A successor, Reverand Laszlo Gerenday, became pastor after having served with the French Foreign Legion; and later the Reverand Imre Kovacs would lead fervid demonstrations against the Communists, protesting Soviet control over Hungary and the loss of basic human rights in his homeland. On July 9, 1944 the congregation held a special service exclusively to protest the treatment of Jews in Germany. At a rededication ceremony on December 31, 1930, Hungarian sculptor Janos Horvay presented the church with three bronze tablets that were originally to be installed in the Kossuth monument on Riverside Drive. Although the population of the Yorkville neighborhood is no longer predominantly Hungarian, the services at the First Hungarian Reformed Church are still conducted solely in the native language. 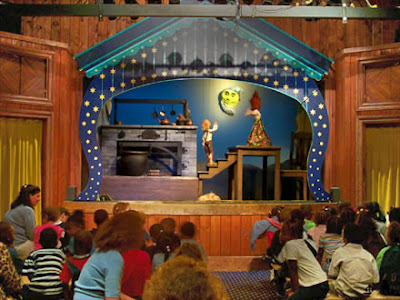 The building was listed on the National Register of Historic Places on August 31, 2000. As the Civil War was coming to an end, four New York City alumni of Harvard University banded together to form a club. The golden age of men’s clubs was dawning, a time when no gentleman of the city would be without at least one exclusive club membership. By the end of 1865 membership had increased to 16 and by 1886 it totaled 431. Meeting in rented dining rooms in tasteful restaurants was no longer feasible. 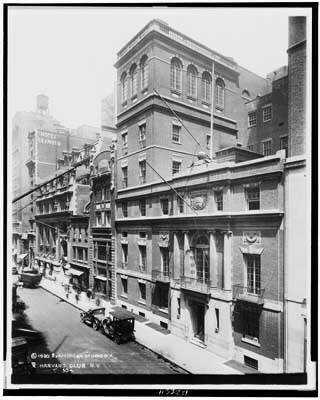 In 1887, the same year that the Harvard Club incorporated, a four-story brownstone at 11 West 22nd Street was rented and converted to a 10-bedroom clubhouse complete with restaurant and comfortable clubrooms. The Harvard Club continued to be a victim of its own success. Within a year membership had increased 25 percent. The new clubhouse was proving, already, to be insufficient. 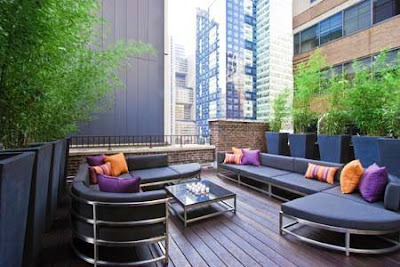 A plot of land at 27 West 44th Street was acquired in the fashionable neighborhood where other clubs were already establishing themselves. Club member Charles F. McKim, head architect of McKim, Mead and White, took on the project of designing the new structure. Drawing inspiration from the early architecture of Harvard, McKim designed a neo-Georgian manor house of dark red “Harvard brick” and limestone. 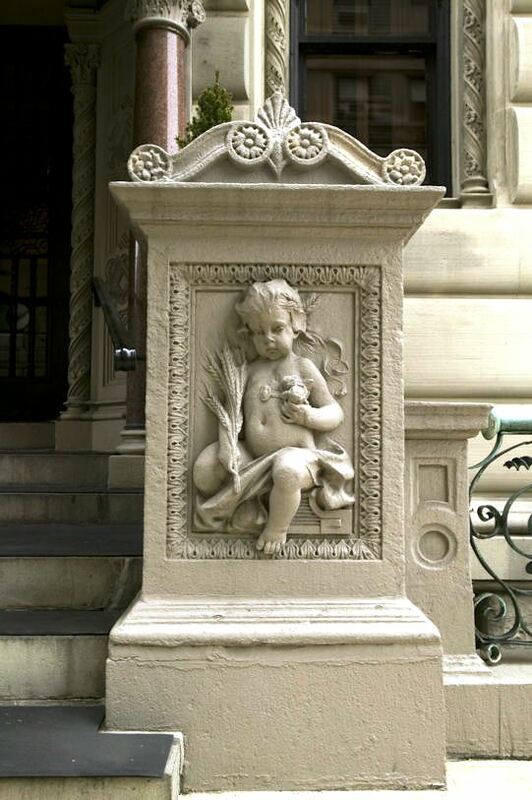 The dignified face featured splayed window lentils and inset plaques of bas-relief swags. The Harvard seal sits prominently above the second floor balcony. The symmetrical arrangement of small-paned windows, Doric columns and a central, arched window dominating the second floor bespoke of the taste and refinement of the members. 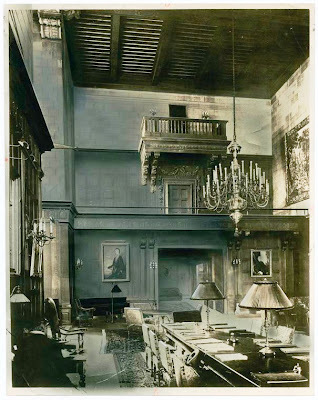 McKim’s interiors reflected the Colonial Revival style of the façade. Early-American turned banisters, broad brick fireplaces with white-painted mantels and paneled wainscoting reflected the 18th Century tone of many Harvard buildings. Having learned from the rapid obsolescence of the last clubhouse, individual members purchased the lots at No. 31 and Nos. 26 through 36 in anticipation of necessary expansion. It was agreed that the land would be sold to the club at cost. Indeed, in 1905 the first addition to Harvard House was constructed to accommodate the growing membership. 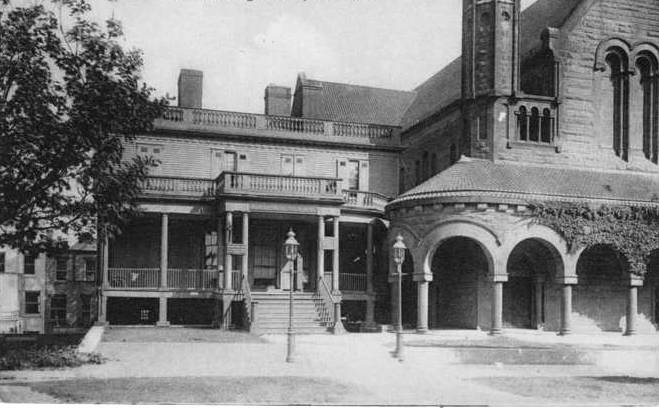 Added to the rear, it included the magnificent, three-story Harvard Hall, a library, billiard room, grill room, a conference room and sleeping quarters. The club that could not stop growing was in need of additional space by 1915. McKim added a seven-story tower to the west end. The extension provided for a new formal dining room, banquet rooms, a swimming pool and squash courts, additional bedrooms and a bar; not to mention up-to-date amenities such as elevators and steam heating. Only a decade later the growing membership was taxing the capacity of the structure again. With no more land, the club initiated negotiations for No. 33 West 44th that dragged on for six years. Unfortunately, by the time the deal was finalized the Depression halted all plans for construction. As the Great Depression ended and World War II began, the swimming pool area was floored over to create more sleeping rooms. After the war, the upper three stories of the house at No. 33 were demolished and the remaining two floors were renovated as an extension. An architect club member redesigned the façade to meld with the McKim exterior; with little critical acclaim. 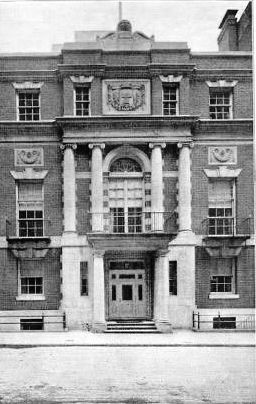 The foundations of the staid club were shaken when, in January 1972, women were admitted to Harvard University for the first time. The question was obvious: if women were to become alumnae, would they therefore be eligible for membership? That 107-year old monument was about to tumble, however. In January of the following year a second vote was taken with the overwhelming outcome of 2097 to 695 to accept women. 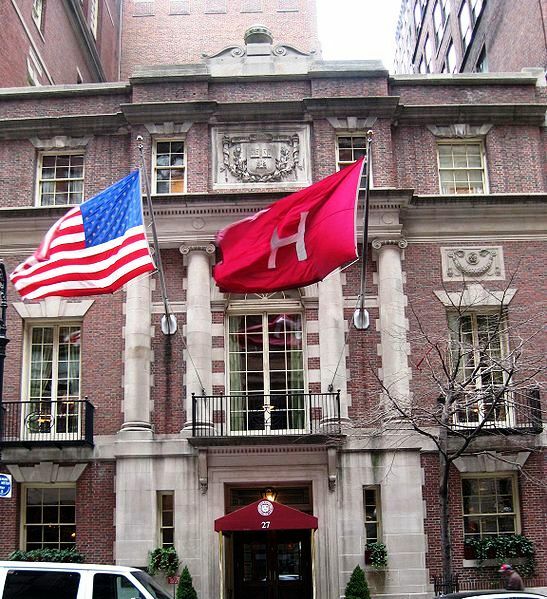 For over a half-century the Harvard Club has made no additions to its structure. The landmarked building that could not stop growing, just possibly has. In 1828 New York City faced the problem of a smallpox epidemic as well as a lack of facilities for the mentally ill, convicts and debtors. The city fathers purchased the East River island on which James Blackwell ran his farm. For $32,500 they acquired adequate land to erect a smallpox hospital, an insane asylum, a debtors house and a prison. Seven years after he had designed the breath-taking Grace Church on Broadway, James Renwick, Jr. was given the commission for the Smallpox Hospital, completed in 1850, the Workhouse, and the City Hospital. In 1872 he was consulted again, this time for a lighthouse on the northern point of the island. Renwick designed a 50-foot tall Gothic structure using the same gray gneiss use for the other city-owned structures. The stone was quarried on site by the prisoners, greatly reducing the costs of the buildings. The octagonal lighthouse used rough-cut stones to imitate a centuries-old building; its entrance sheltered by a modest Gothic arch. 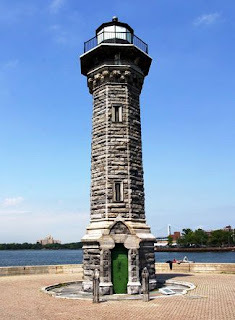 At this point the myth and the history of the Blackwell Island Lighthouse become blurred. Some legends contend that instead of a seawall the inmate, who feared a British invasion, built a fortress. Whichever (if either) story is correct, the structure had to come down to make way for the lighthouse. 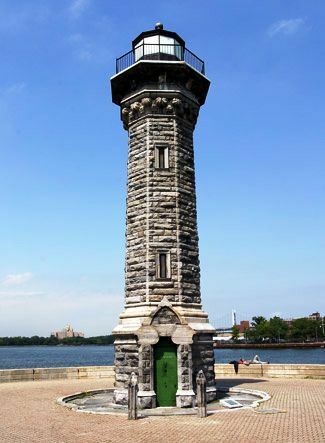 Traditional folklore on Roosevelt Island (the last name given to Blackwell Island) goes on to say that the inmate, John McCarthy, was bribed or paid to destruct his own fortress; and then he was given the allowance to build Renwick’s lighthouse. The legend becomes more muddled when the name Thomas Maxey, Esq. is added to the mix. Both Maxey and McCarthy are named as the builder (Maxey was apparently also an inmate); and there is the possibility that both are the same man. 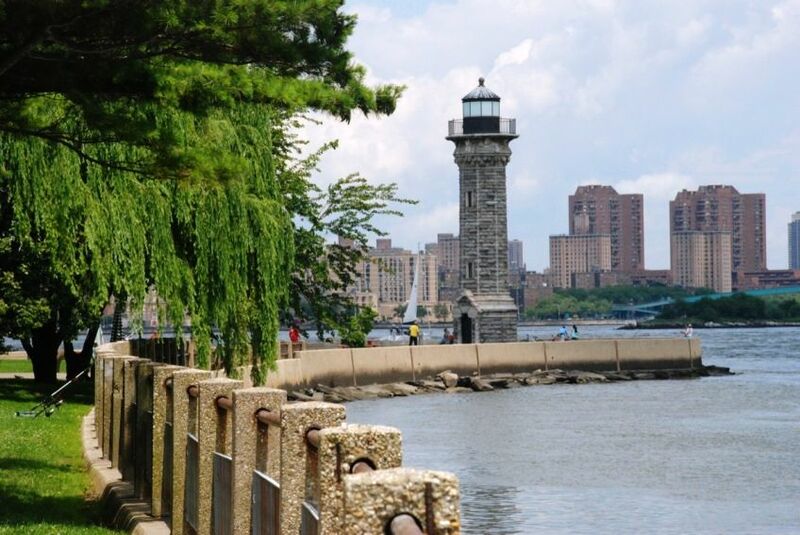 Whoever built the Blackwell Island Lighthouse did a professional job. Additionally, the concept of a single man building such a structure is difficult to accept. Nevertheless, there is no surviving documentation to confirm or refute the legend. The lighthouse was in use (although occasionally not working) until around 1940. In the 1970s, when most of Roosevelt Island’s historic buildings were falling into disrepair, a modest restoration was done using private donations. 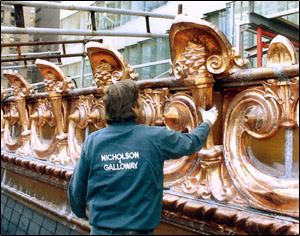 A complete restoration was initiated in 1998 through an anonymous donation of $120,000, making the light functional again. Once Charles Frohman built the Empire Theatre at Broadway and 41st Street in 1893 the development of the entertainment district in Times Square was on. As the theatres cropped up, developers William Rankin and Alexander Moore seized the newly-created opportunity. That same year they commissioned little-known architect George Keister to design a smart, residential hotel that could conveniently house well-to-do tourists and long-term occupants involved in the theatre. 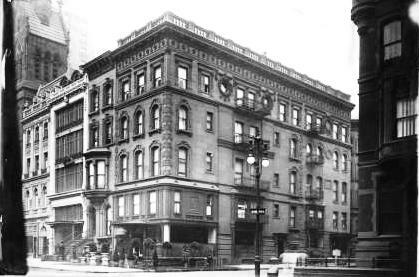 In 1894 Keister’s hotel was completed. The tallest building in the area, it was meant to impress. A sophisticated blend of styles – Renaissance, Gothic and Romanesque – it rose 13 stories with bay windows, arches and balconies. Prominent, steep gables, reminiscent of Hardenbergh’s Dakota Apartments of a decade earlier, flanked central, exuberantly-decorated dormers. The 362-room Hotel Gerard attracted the well-heeled, as intended. In January 1898 Colonel and Mrs. Richard Henry Savage celebrated their 25th wedding anniversary in the banquet hall. High-ranking military officials attended, as well as dignitaries from Russia, Siam, Austro-Hungary and Germany. The room was the site of similar impressive gatherings for years – such as the Baltimore & Ohio’s grand dinner for 250 in 1914. Fortune, however, would not smile on the Hotel Gerard for long. 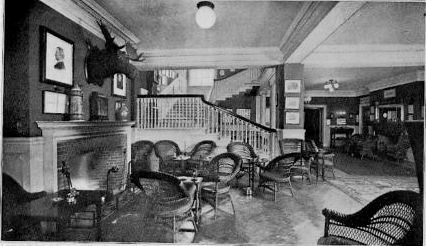 Although the hotel remained a favorite among the theatre set – actors Albert Phillips, Arthur Burckly, character actress Josephine Williams (who lived here 25 years) and playwright Augustin Machugh all long-time residents – the hotel was attracting a seedier clientele. In 1921 Harriet Pendleton Hunt, “of a well-known Cincinnati family,” was arrested in her room for passing a worthless $10,000 check. On October 29, 1923 a shoot-out among convicted bank robbers took place in the ninth-floor corridors. One escaped convict, 23-year old Thomas J. Gillen, was shot three times in the stomach while six others escaped. 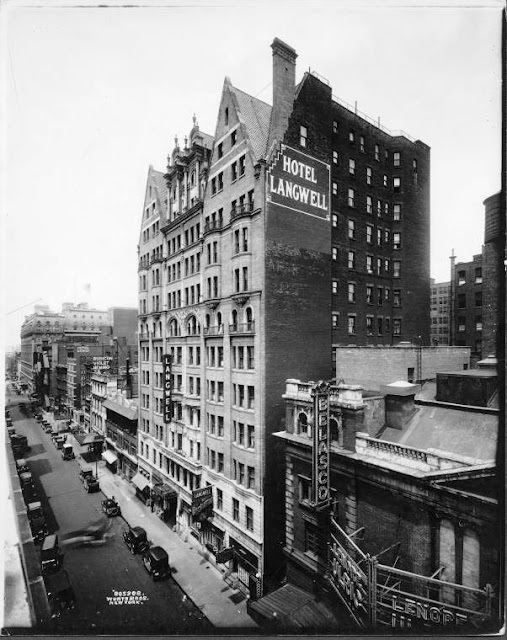 More trouble came for the hotel, now called the Hotel Langwell, in 1928 when Metropolitan Opera diva Mme. Marie Rappold was drugged by a thief using a passkey to her room. She reported $75,000 worth of jewelry stolen. And in 1932 resident John Evans, whom The New York Times deemed “a thug,” was arrested for pistol possession and assault. The hotel became the site of repeated suicides. Here William James Henderson, one of America’s most influential music critics shot himself; as did Washington Seligman, the brother of Mrs. Benjamin Guggenheim. Several female guests, by the 1940s, threw themselves from their hotel windows. During the Depression, the Langwell was lost to foreclosure and sold by the Harlem Institution at auction in 1934 for $585,000. Twelve years later when it was sold again the building was cited for numerous fire hazards as the property continued to decline. Once again, in 1950, it was taken by foreclosure and sold for $700,000. As the Times Square area eroded, the once-proud hotel fell into decrepitude. Apartments which at one time boasted libraries and sitting rooms were now broken up to tiny single-room occupancy warrens. On January 25, 1969 a raid on the Langwell seized over $1 million in pornographic tapes. With the renaissance of Times Square in the 1990s came a reprieve. 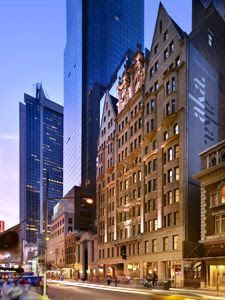 In 2007 the building was renovated and restored by Korman Communities as AKA Times Square – a post residential hotel of 105 suites, including duplex penthouses with terraces. 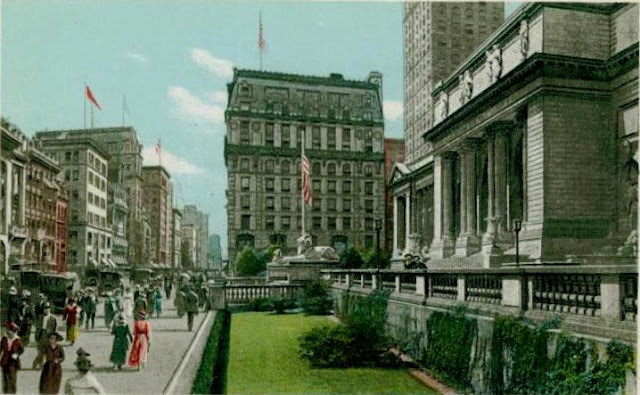 On September 21, 1902 depositors in the New York County National Bank grew nervous. The bank showed a deficit of $43,250 and its reserves were wiped out. Bank president Francis L. Leland, however, refused to allow his bank to crash. Leland’s father, Francis Sr., had been president from 1857 until his death in 1885. The New York County National Bank was essentially a family business. Within four years Leland’s bank had recovered so well that a new, imposing structure was planned for the southwest corner of 14th Street and 8th Avenue -- directly opposite of the classical white marble New York Savings Bank on the northwest corner. The bank’s board selected the architectural firm of DeLemos & Cordes to design their new headquarters. 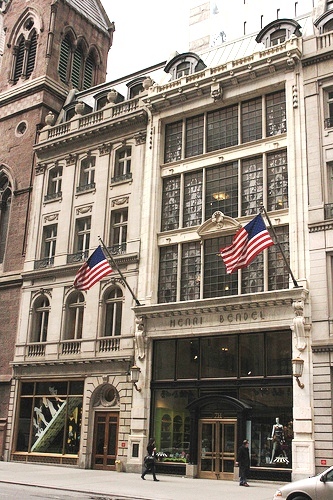 The firm was responsible for the magnificent Siegel-Cooper Dry Goods Store and the Adams Dry Goods Store on 6th Avenue, and for the beautiful new Macy’s Department Store on 34th Street. Rudolph L. Daus, a graduate of the Paris Ecole des Beaux-Arts, was given the project. Daus produced a limestone-clad neo-classical temple with Beaux-Arts touches. Enormous Corinthian columns support the majestic entranceway above a short flight of steps where a recessed arch rises the equivalent of three-stories. In the pediment above, a striking vigilant eagle in near full-relief cranes its neck beyond the cornice-line. Four arched windows on the 14th Street side match the entrance. Separated by Cornithian pilasters, each window arch incorporates classical pseudo-doorways where Daus included in the ornamentation caduceuses – so often associated with the medical profession – as a reference to Mercury, the god of commerce. 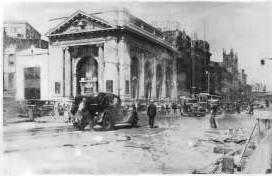 The bank did lose its identity wholly, however, in the 1930s when it was absorbed by Manufacturers Trust Co., later to be renamed Manufacturers Hanover Trust in the mid 1960s. 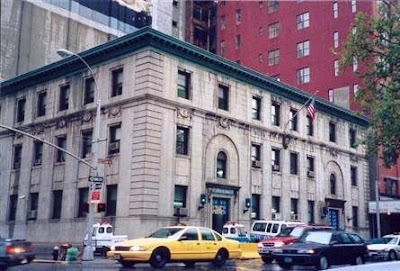 The institution used the building until it merged with Chemical Bank in 1994. Afterwards the monumental building sat empty until it was briefly used as a theatre. Then, in 1999, Lee Harris of Hudson River Studios and John Reimnitz converted the space for Nickel, a men’s spa created by Philippe Dumont; and designed an addition for residential apartments. 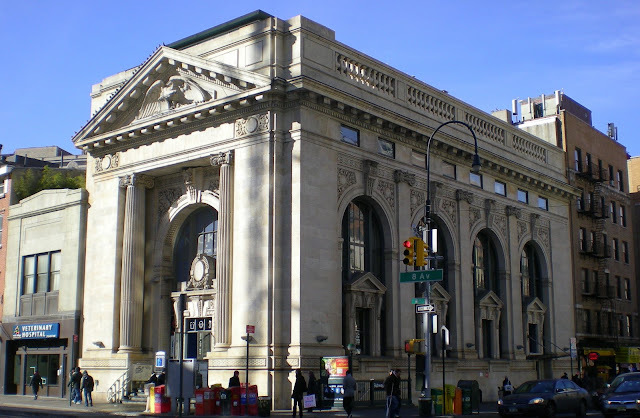 Rudolph Daus’ impressive limestone bank was designed a New York City Landmark in 1988.